Vermont libraries are embracing the video! The Mount Holly Town Library urges townspeople to Vote YES on Article 7 in a YouTube video created by two high school students at the local public access TV station. Like the Manchester videos, Mount Holly has users like parents, a painting group, and an audio book listener speaking on behalf of library services. Great year for pre-town meeting publicity in Vermont! Manchester Community Library is using Vimeo to encourage voters to Vote Yes on town meeting day, to support the public library. Take a look at their Channel to see what they’ve created. The videos are displayed on the MCL website, in newsletters, and of course at the MCL channel on Vimeo. The campaign includes stickers and a strong message, Vote Yes on March 1. Not voting is the same as voting no, a citizen tells us– and that means cuts in hours and services. The messaging in “I’m cheap” is particularly appealing– a senior citizen who lives on a fixed income supports the library because he likes to save money. While walking and driving around Manchester, our hero talks about the library and how he saves by attending lectures, borrowing magazines and books, and taking his grandchildren in. He calculates what the Library cost him in taxes– $47, or less than a dollar a week. The scripts for these videos are carefully written to appeal to many audiences, parents, seniors, small business owners. The images are appealing– happy faces, the clean new library, the cafe where people have their heads together. Each video is well-edited and short, with “I’m Cheap” under two minutes. Why Vote Yes is a page on the MCL website that gives the numbers– what the Library costs and how it’s been used this year. The total amount from town taxes is increasing; the share of the total library budget is dropping because of other sources of support. The usage statistics are easy to understand: people using computers. Nice job! –More than 1,300 brand new members joined the new library. –Over 50 community groups held meetings at MCL. –Over 800 preschoolers and their parent/caregivers attended story times. –People logged on to the public computers nearly 6,000 times in the first year of operation. –More than 300 members took advantage of free 1-on-1 tech tutorials, eager to take advantage of enhanced their understanding of technology. Many public libraries host physical collections of local high school yearbooks– what if they also linked virtually to the high school yearbooks? Cutler Memorial Library and Rockingham Free Public do, and here’s how it happens. The Oklahoma Correctional Industries hosts The OCI Yearbook Program, free scanning of high school yearbooks. Use the contact email and phone number, ocirc at doc.ok.gov for OCI Records Conversion, (405) 527-0830. Libraries provide the yearbooks, inmates scan the pages, OCI returns a DVD to the library which chooses a site for the images. Brian Herzog’s Swiss Army Librarian offers some project background for librarians who want to know more. And yes, OCI provides packing details and pays the postage. Google’s Open Gallery is the Cutler Memorial Library online digital archive for historic materials of Plainfield, including the neatly typed and drawn 1934 Yearbook. The Rockingham Free Library online yearbooks link takes the reader to a Flickr account, 10 yearbooks per page. OCI recommends loaning out the DVD for nursing home visits, individual use and high school reunions. What about copyright permission? Good question. Email amy.howlett at vermont.gov if you figure it out. …the process of community development is being seen as an art as well as a science. Part of the art is bringing people together on an emotional and spirit level to work together to solve problems. Another part is to help residents who may disagree on methods to recommit to the health and well being of their community. Poetry has the ability to transcend the structures of our language and connect with us others in a way we couldn’t otherwise. The poet laureate will participate in public events like Town Meeting, hold poetry readers at the library and other locations, and lead events during April, National Poetry Month. The Poet Laureate will also compose a poem for the Town Report The honorarium for the two year position is $25, paid by the Town of Shelburne. The Norwich Public Library partnered with a bookstore and local bar to kick the holidays off this year. Sounds like a low key event with high visibility, trading on the library brand, books. Terrific that the bookstore donates 20% of the take to the Library. Discuss good books with local librarians, booksellers, and fellow book-lovers while enjoying a glass of wine, beer, or seltzer. Participants will have the chance to purchase recommended titles from the Norwich Bookstore, which will donate 20% of proceeds to the Norwich Public Library. Doors will open at 6:30. This event is co-sponsored by the Norwich Bookstore, the Norwich Inn, and the Book Jam Blog . 3D printing: where to start? The Orwell Free Library hosted a program on 3D printing, thanks to a generous local presenter, Rod Batschelet. He is a local computer geek who owns a 3D printer and loves to get people exposed to new technology. Rod walked in one day and asked if he could work with the library to provide the event for the community. Director Kate Hunter said, YES! Rod teaches 3D print classes at Castleton State College and also works at the Benson School. Orwell is lucky to have him in town– and doubly lucky to have a library willing to try new tech! 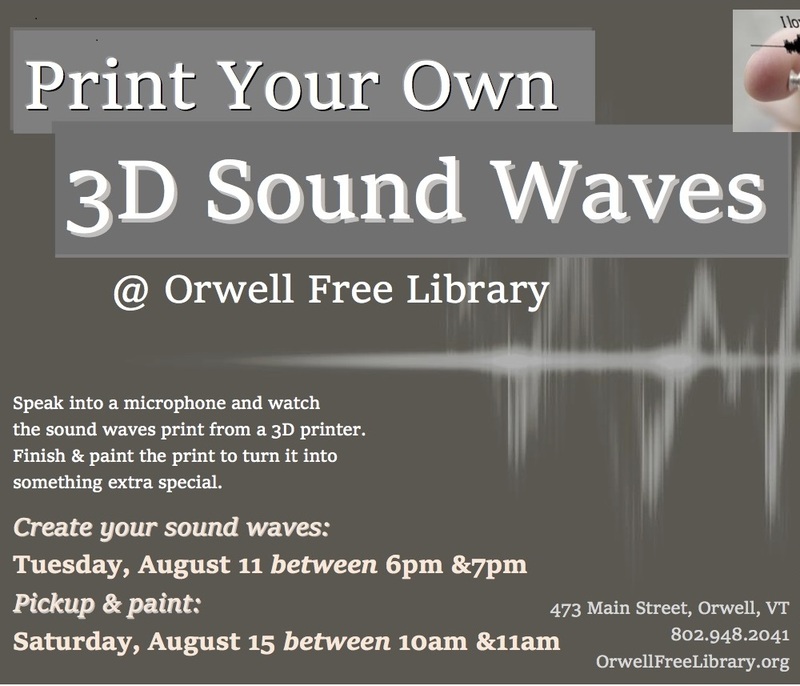 Rod shared his explanations with the Orwell Free Library– so here we have the actual process, from downloading software to capture voices to creating the jewelry from the 3D printer products. Windsor Public Library will be having a bi-weekly Yo-Yo Club for ALL ages (kids, teens AND adults!). Yo-Yo Club will meet every other Wednesday at 2:30pm starting Wed. June 24th. New yo-yo students receive a card with a trick list on it. Learn cool tricks and earn proficiencies of Novice, Expert, Master, Pro, and Grand Master! Classes are taught by our director, who also happens to be a former international yo-yo performer! 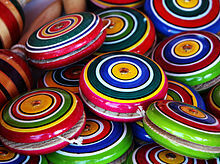 Bring your own yo-yo, or let us help you purchase a yo-yo for use. Yo-yos are also available to borrow for classes and to check out through the library. Many thanks to All For KIDZ, producers of The NED Show, for their donation of yo-yos, holsters, and extra string! There’s a lesson here: if the director has a special talent, the library can plan a whole program around it! Christine Porter offered the first workshop in February and 20 people came. Another good turnout happened in April– so the Library launched an official club as soon as school closed for the summer.